Luxurious appearance, stunning sound, impeccable touch: The new range of Classic Series luxury digital pianos crafted by Japan’s premier piano company. Kawai has been creating world-class musical instruments for over 90 years – maintaining traditional hand-crafted processes while embracing original ideas, in a passionate quest to perfect the art of the piano. 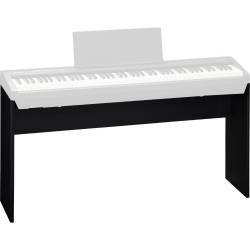 The compact CS4 digital piano utilises the new Responsive Hammer 2 (RH2) keyboard action, featuring KAWAI’s Ivory Touch key surfaces and let-off simulation for maximum control and repetition. 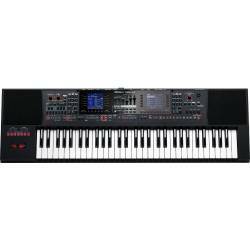 In addition the latest Progressive Harmonic Imaging 88-key piano sampling technology with 192 note polyphony and a variety of additional functions is used. 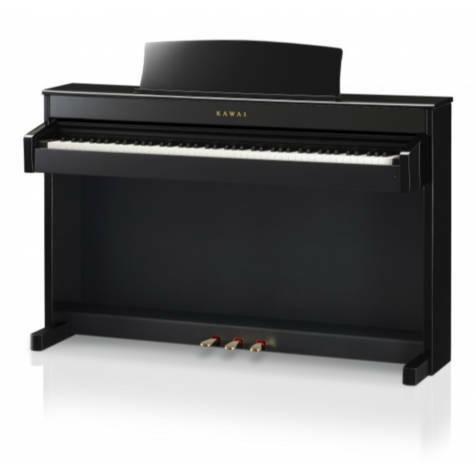 With a traditional furniture design and attractive Premium Rosewood, Cherry, Mahogany, and Black Satin finishes complementing the exceptional touch and authentic tone of this charming instrument, the CS4 truly establishes a new standard in digital piano performance, quality, and value. The new CS Series’ class-leading Responsive Hammer II keyboard action recreates the supreme touch of an acoustic grand piano, with its realistic movement and rigid, springless design providing a smooth and natural piano playing experience. The instruments’ modern, triple-sensor key detection system enhances responsiveness and accuracy, with structural reinforcements throughout the action assembly helping to minimise horizontal key wobble during staccato and fortissimo passages. The weight of the keyboard is appropriately graded to mirror the heavier bass hammers and lighter treble hammers of an acoustic piano, while let-off simulation recreates the subtle ‘notch’ sensation felt when softly playing the keys of a grand piano. These important characteristics allow discerning pianists to practice their expanding repertoire with confidence, and ensure that there are no unpleasant surprises when called upon to perform using the finest acoustic grand pianos. 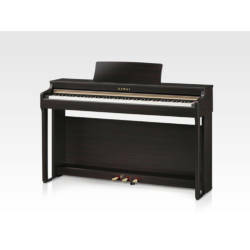 The impressive CS Series features Kawai’s highly regarded Ivory Touch key surfaces as standard. This finely textured material gently absorbs fingertip perspiration and oils to assist playing control, and possesses a natural, matte finish that is smooth but not slippery. Furthermore, this moisture is absorbed without dirt or grease permeating the surface, allowing the keytops to be wiped clean easily using just a damp cloth. 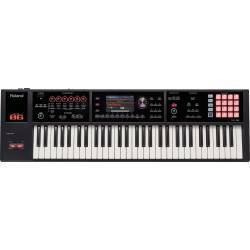 Complementing the grand piano-like keyboard touch, the Responsive Hammer II action also features a new triple-sensor key detection system for enhanced playing realism. The third sensor improves responsiveness when playing the same key repeatedly, and also allows the sound of a single note to be gradually ‘layered’ without the previous tone being lost. 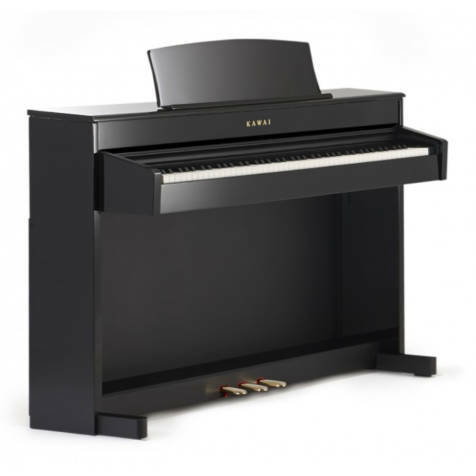 In addition, improvements to the CS Series’ sound hardware also permit the speed at which keys are lifted to influence the release character of piano sounds, providing a greater range of expressive detail between staccato and legato playing. The beautiful sound of the Kawai EX concert grand piano is at the heart of the new CS Series, with all eighty-eight keys of this world-class instrument painstakingly recorded, meticulously analysed, and accurately reproduced as high-fidelity digital waveforms. Recording each key individually in this way – as opposed to stretching the same tone over several different notes – preserves the rich harmonic character of the EX concert grand piano, and guarantees that the sound heard when playing any one of the CS Series’ keys is a faithful representation of the original acoustic source. When playing a fine piano, the amount of pressure applied to the keyboard affects not only the volume of the sound produced, but also the unique tonal character of each note. Therefore, in order to construct a realistic acoustic portrait of the EX concert grand piano, not only is each key recorded individually, but also at various different volume levels, ranging from gentle pianissimo to thunderous fortissimo. 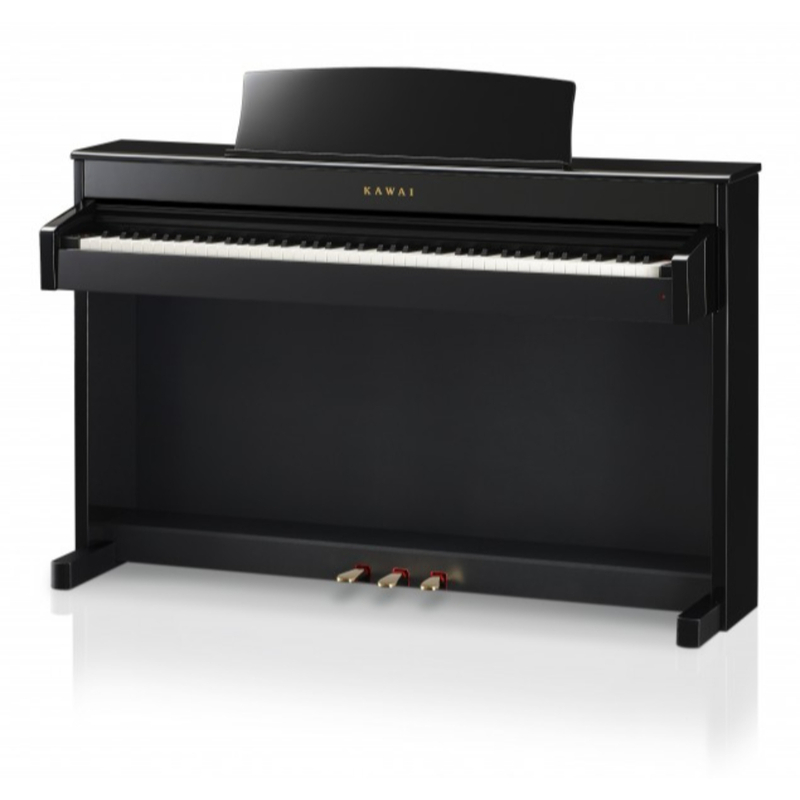 The new CS Series offer a highly detailed acoustic portrait, employing Kawai’s unique Progressive Harmonic Imaging sampling technology to ensure smooth tonal transitions across the keyboard and throughout the entire dynamic range. The CS Series’ powerful new digital effects engine further enhances the instrument’s superior core sounds, applying additional layers of detail and realism that bring performances to life. The depth of a performance can then be transformed using the instrument’s updated reverb features, allowing pianists to position themselves within one of six acoustic environments, ranging from a small practice room to an inspirational grand cathedral. Complementing the instruments’ excellent Responsive Hammer II keyboard action and impressive Progressive Harmonic Imaging piano sound, the new CS Series also offer a strong selection of digital piano features that further enhance one’s musical enjoyment. Dual, and Four Hands keyboard modes , and a rich assortment of instrumental voices add greater variety to players’ performances, while the convenient metronome function and integrated Alfred course books ensure that regular practice is both productive and engaging for aspiring pianists. The new CS Series models feature song recorder capabilities that both enhance one’s playing enjoyment and can also assist piano study. The CS4 recorder has a expanded functionality with 3 songs recording with up to 15000 notes, allowing individual left and right hand parts or two different voices to be recorded separately, then later played back together. 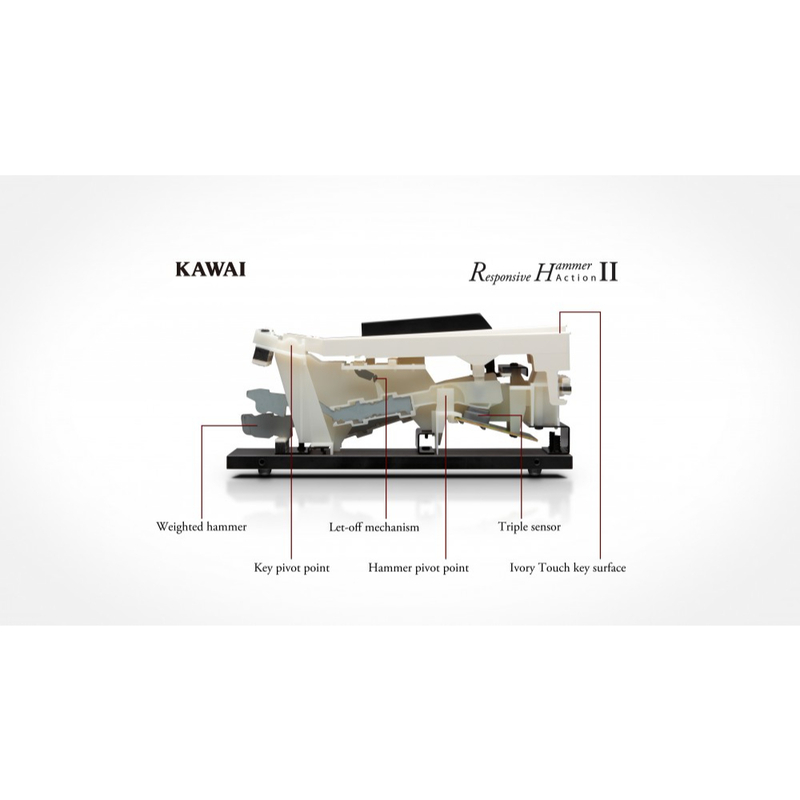 Reinforcing the CS Series’ reputation as the most realistic digital pianos in their price range is Kawai’s Grand Feel Pedal System. This new development accurately replicates the individual weighting of the damper, soft, and sostenuto pedals of a Kawai EX Concert grand piano to further enhance acoustic piano authenticity. The new CS Series utilise modern, energy efficient components that reduce electricity consumption by approximately 50% (compared to previous models), while the instruments’ optional power saving feature can also turn off the piano automatically after a specified period of inactivity.